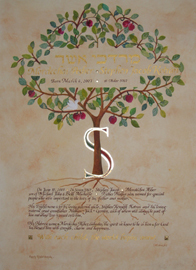 This design is available as a Ketubah. 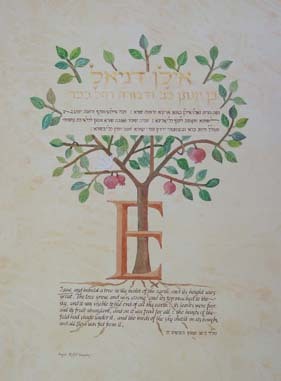 The text in brown, or any colour of choice, can be written above, below, or on the side of the tree. In this design the Pomegranate symbolizes Prosperity/Abundance, and the white Dove symbolizes Peace and Tranquility. The family name initial embracing the tree trunk can be in 23K Gold Leaf.